How do seat belts and car seats work? The single most important thing you can do to protect yourself and your family members is to make sure everyone in your car is buckled up every single time the car is moving. With few exceptions, North Carolina law requires all people in a car (including the back seat!) to be properly buckled up. For older kids and adults this means using a seatbelt and wearing it right. Officers can write tickets for improperly worn seatbelts. If the ticket is for a child under 16 years old, the driver may have to pay up to about $250! Learn more about North Carolina’s laws here. There’s no magic number. 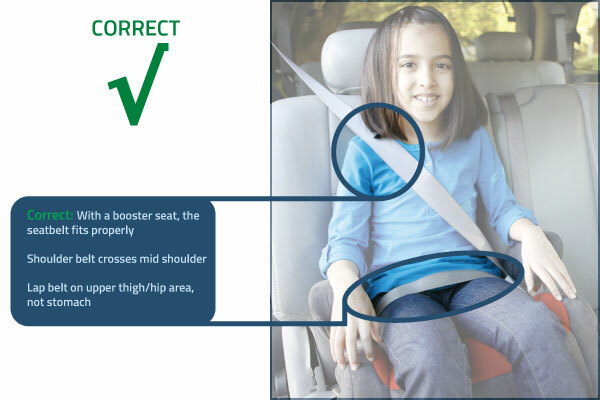 Kids need a booster seat until the seatbelt fits properly without it. In North Carolina, when a person turns 16 years old they are eligible to get a driver license. But, we don’t just issue a license to everyone automatically on their 16th birthday. Instead, we require teens to meet a number of requirements and pass a driving test first. Some teens will be able to meet all the requirements on their 16th birthday. Others may need extra time before they are ready. Some kids may be able to pass the “seatbelt fit test” on their 8th birthday. Others will need more time to grow before the seat belt fits correctly. 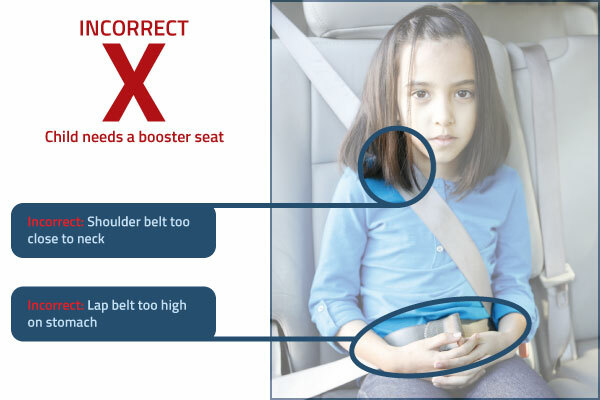 If the seatbelt does not fit correctly, the child still needs a booster seat. So how do we determine if the seatbelt fits correctly? Kids come in all shapes and sizes, so every child’s safety needs are a little bit different. Here are tips to help figure out what “fit correctly” means for your child. 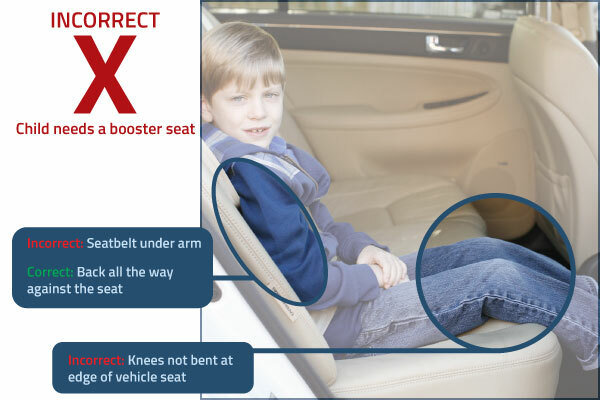 Children whose knees do not bend at the front edge of the vehicle seat will likely end up slouching down until their knees bend and they are more comfortable. When this happens the seatbelt will come off the hip bones and onto the stomach area. Children whose knees do not bend at the edge of the vehicle seat need a booster seat. 2. Shoulder – The shoulder belt crosses mid-shoulder – not too close to the neck and not too close to the arm. The shoulder belt helps keep the upper body in place during a crash. 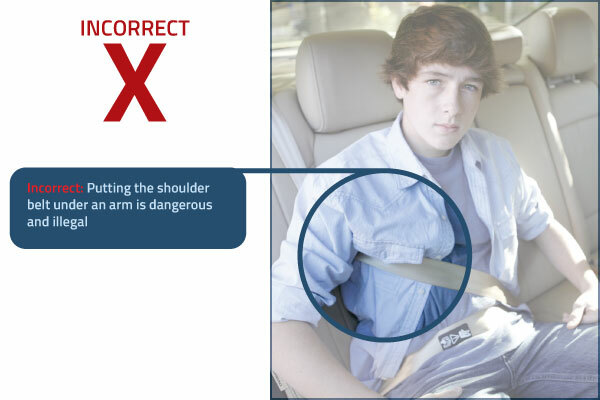 Without the protection of the shoulder belt, the upper body can move too far forward during a crash. When this happens the head may strike whatever is in front of it (the back of the front seat or vehicle dashboard depending on where you are sitting) potentially causing significant injuries. If the shoulder belt rubs the neck it is very uncomfortable. If the shoulder belt is too close to the arm it could slide off the shoulder giving less protection. 3. Hips – The lap belt crosses the body on the upper thigh/hip area – not on the stomach. The position of the lap belt is especially important and is often overlooked. It is important that the lap belt crosses the strong hip bones. In a crash, your bones will help protect you from injury. 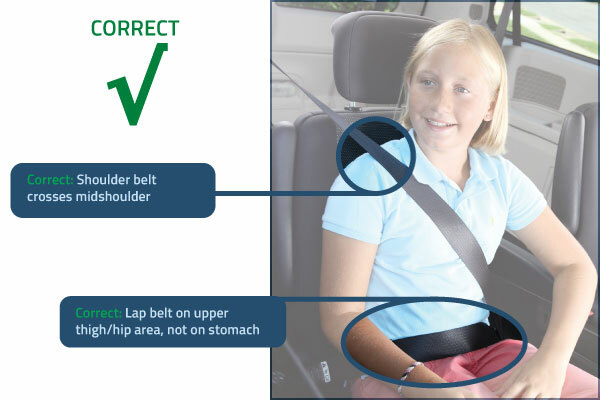 If your child is not big enough to use the seatbelt alone, the lap belt will be on the stomach instead of the hip bones and in a crash the child could be seriously injured when the lap belt digs into the stomach. 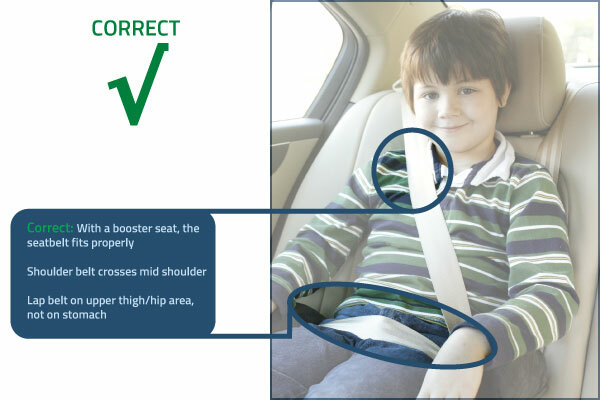 Want to see some examples of incorrect seatbelt fit? Many people do not realize that putting the shoulder belt under an arm or behind the back is dangerous and illegal. However, if the shoulder belt is not in the correct position it cannot work the way it is supposed to work. It is important for the shoulder belt to ALWAYS cross the shoulder. Putting the shoulder belt under the arm or behind the back is both unsafe and illegal. 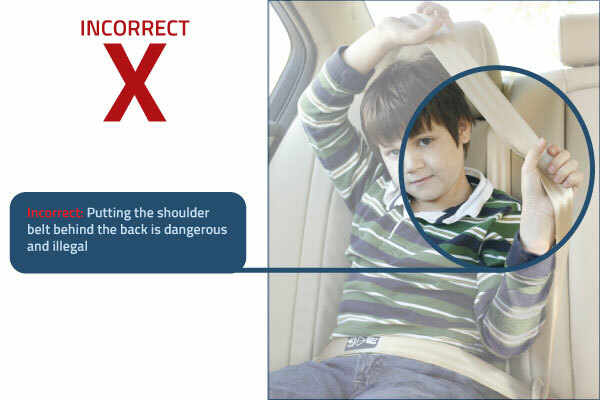 Sometimes children will put the seatbelt under and arm or behind their back because the seatbelt is uncomfortable. 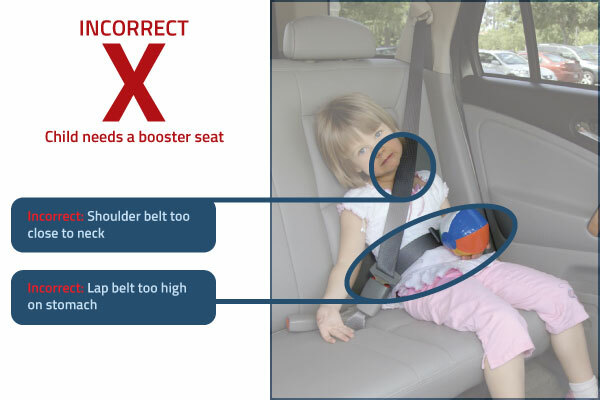 If a child finds the seatbelt to be uncomfortable they probably still need a booster seat to make the seatbelt fit correctly. How do booster seats work? Booster seats are for older kids who aren’t yet big enough for the seatbelt to fit on its own. 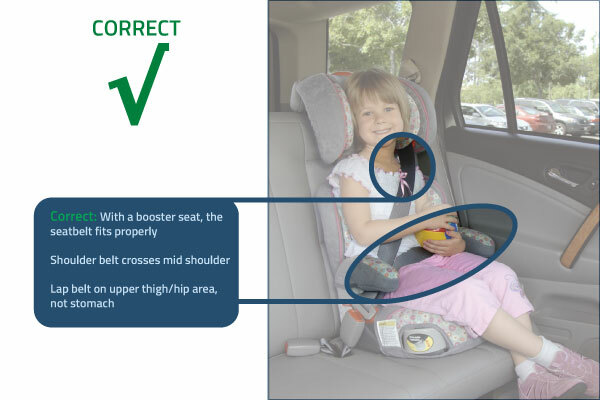 Booster seats work by boosting up the child so that the seatbelt fits properly. The seatbelt does all the work, the booster seat just helps to put the seatbelt in the right place. It is important to continue using a booster seat until the seatbelt fits properly. Note: Booster seats cannot be used with only a lap belt. If your vehicle does not have lap/shoulder belts refer to “Choosing and Using Car Seats Frequently Asked Questions” for more information. All images on this page courtesy of NHTSA.